Edmonton, Alberta--(Newsfile Corp. - March 11, 2019) - Benchmark Metals Inc. (TSXV: BNCH) (OTCQB: CYRTF) (WKN: A2JM2X) (the "Company" or "Benchmark") is pleased to report a 350 metre extension to the Cliffs Creek mineral resource area from successful step-out drilling at the Lawyers Gold & Silver Project. The Lawyers Trend is located in the prolific Stikine Terrane of the Toodoggone Mineral District, which also hosts the Golden Triangle region of British Columbia, Canada. CEO John Williamson commented: "Our successful 2018 drill program, which comprised approximately 4,122m in 38 holes overall and 2,085m in 18 holes at Cliffs Creek, intersected significant gold and silver mineralization in the majority of holes. 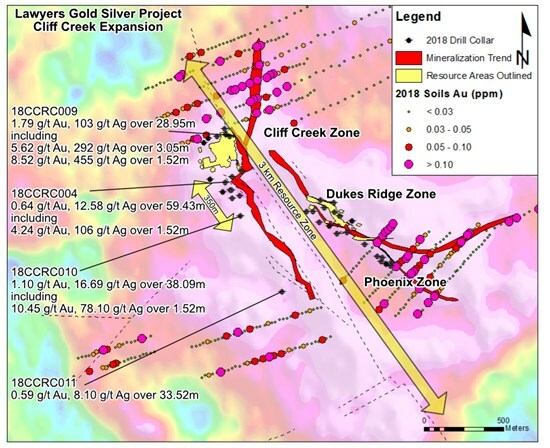 This drilling extended the mineralized zone 350m southeast of the Cliffs Creek maiden resource area near the Northwest portion of the mineralized Lawyers Trend. The resource and mineralized trend remains open to the southeast and to the north across a northeast oriented fault. The north offset target area is defined by anomalous soil samples collected during 2018."